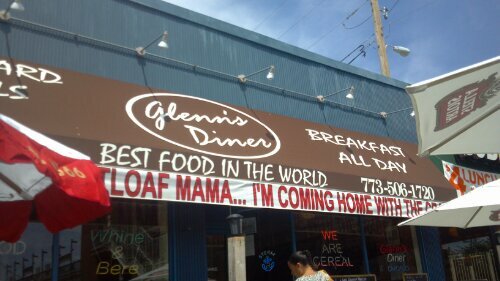 If you’re a food lover and you live in Chicago, odds are you’ve dined at Glenn’s Diner. Tucked feet West of the Montrose Brown line stop, Glenn’s unassumingly serves up some of the city’s best fish disguised behind a diner facade. There’s a lot to love about Glenn’s. From the incredible selection of kids breakfast cereals – yes cereal. They offer an endless cereal bowl for those of you who wake up early enough for breakfast. For lunch and dinner there are essentially two menus at Glenn’s. First, their diner menu is just that. A typical, but very well executed assortment of sandwiches, salads and entrees that are inspired by traditional diner fare. I’m extremely partial to their Reuben. Consistently it has proven to be one of the better versions around. They chop up their corned beef a bit and mix it evenly with the sauerkraut and cheese so that every bite is easy to eat and absolutely contains a bit of every tasty element. On this visit, however, I did not order the deli staple. On this fine trip we chose to dine al fresco and a perfect day for it indeed. 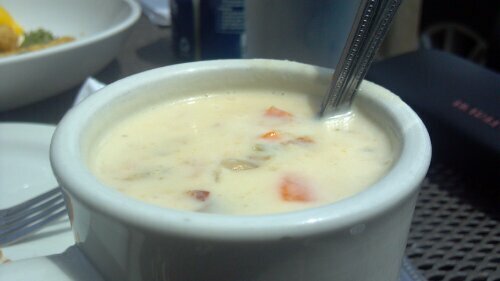 My close buddy Johnny has always touted their white clam chowder as the best in our fine city. Unlike many a folk, I actually try stuff when recommended by those I trust. 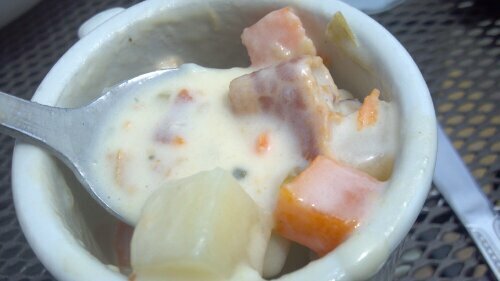 On first glance, from the surface, the chowder looks like your standard cup of soup. But once you dig your spoon and pull up some of the delicious chunks of goodness that rest within, you begin to realize how this is not your typical clam chowder. The consistency isn’t too thick and still packs layers of flavor. You can easily polish off a cup or even bowl of the great goodness and still be up for an entree and maybe even dessert. What also sets this chowder apart from the rest is the delicious smoky chunks of bacon that float amongst the clams and veggies. The layering of flavors, excellent texture and balance in what is typically a super rich soup, makes this one at Glenn’s, yes, the best in the city. Thanks Johnny. 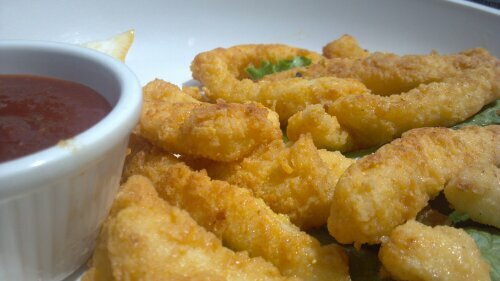 Now if you’ve been following the blog for a bit you’re well aware that we live a great fried calamari. 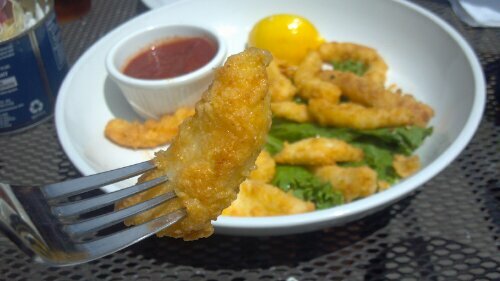 There are plenty of poorly executed examples of the dish around town but Glenn’s stands out as being a tip contender for best fried calamari of all time. I would only make such a statement if my gut was completely sure of a dish’s worthyness. 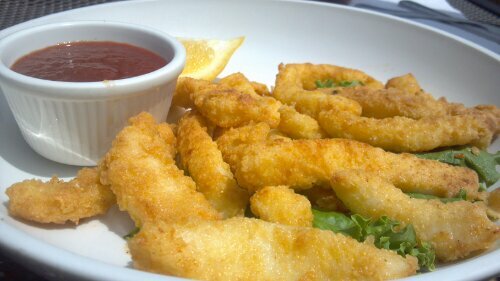 The Drake’s breading coated squid are served piping hot from the fryer. The whole squid was laid out and sliced into what I’d almost call strips of calamari steak. So tender, and flavorful. The cocktail sauce is fresh and spicy. No tentacles? In this case, no problem. On first bite, Jill and my eyes met and we instantly knew what the other was thinking – Contender for Best Calamari…maybe ever. It was so different from other examples in it’s “finger-like” presentation, over-the-top tenderness and sourcing of extremely high quality and fresh product. Next up were two of the house specialties. 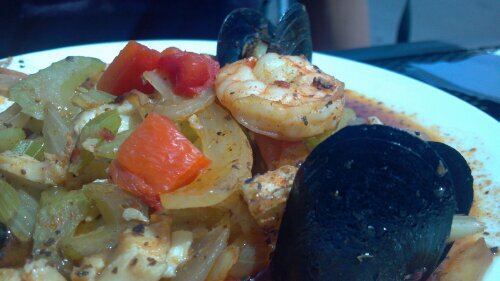 Jill enjoyed the lunch portion of Cioppino, a traditional San Francisco seafood stew. Much like a French Bouillabaisse, Cioppino is a rich savory and often spicy red broth hosting a melange of delicious seafood from clams to mussels to shrimp and fish. 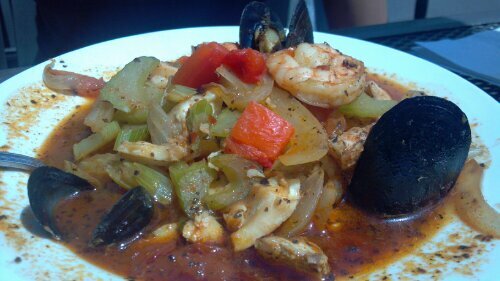 For thirteen bucks this was without a doubt the best Cioppino or seafood stew for that matter, you’ll find just about anywhere I’d imagine. The fish was incredibly fresh since it was crafted in a kitchen receiving large daily deliveries of quality fish and seafood. The broth was flavorful and well put together. From the zesty lively tomato base, the spices added provide just that right kick that sets apart decent seafood stews from the best. The fish and other morsels within the broth were cooked properly – not at all over which would result in a rubbery texture that’s absolutely undesirable. In the end, Jill couldn’t recommend this enough to someone with a Cioppino or Bouillabaisse craving. 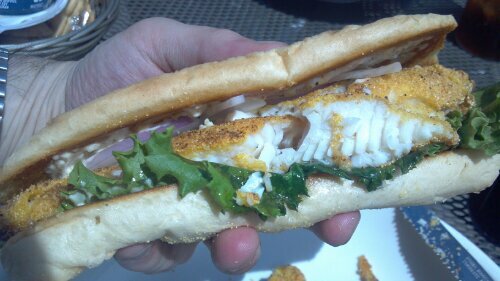 Then came the Catfish Po’ Boy. 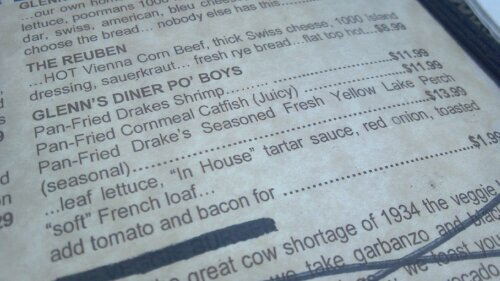 I have never ordered Catfish anywhere – ever. Both Jill and I agreed that this would be the place and time to give it a shot – sandwich form. 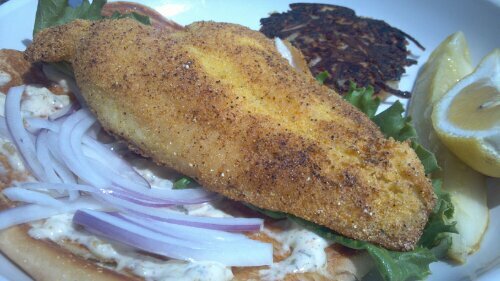 The catfish itself was excellent. Very mild in flavor, a little flaky and fried to perfection. 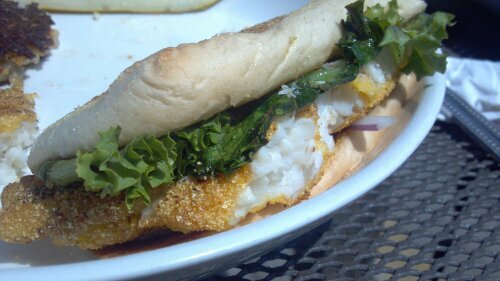 A nice Po’ Boy style French roll, toasted slightly came dressed with the fish, lettuce and a light zesty mayonnaise. It was delicious. If there was any preparation of catfish that I believe would showcase the potential of this bottom dwelling fish, it would be here, at Glenn’s. 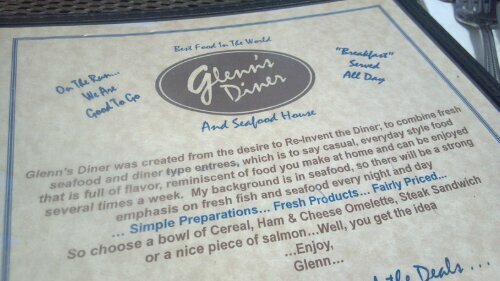 Go to Glenn’s for the cereal, diner food, fish…whatever – you won’t leave disappointed or hungry. Don’t forget to tell ’em Hungry Hungry sent ya! ← #137 – 2 Sparrows. Shrimp ‘n’ Grits amongst the city’s Top 50 Foods.